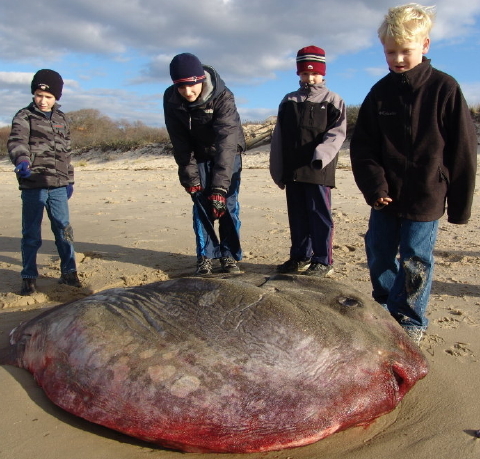 Giant ocean sunfish (Mola mola) strand in the shallows of Cape Cod Bay each fall. These enormous, seven-foot diameter creatures, the largest bony fish in the ocean, are exotic and impressive. 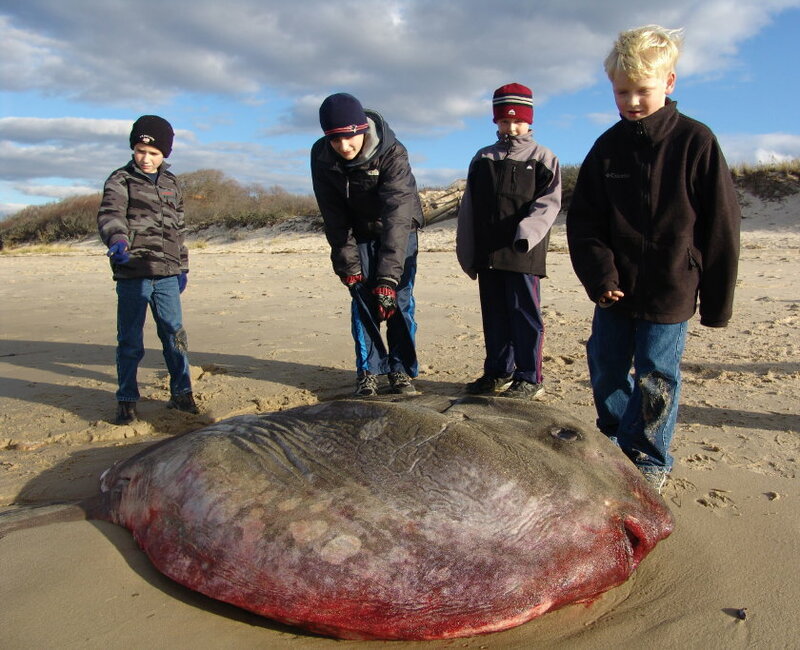 Four young boys joined Turtle Journal last October to examine an ocean sunfish that had washed ashore on a Mid-Cape bayside beach. For background information on ocean sunfish and their strandings on Cape Cod, see Exotic Ocean Sunfish (Mola mola), which includes a hyperlink to an interview on Mola molas by Mass Audubon’s Bob Prescott, director of the Wellfleet Bay Wildlife Sanctuary. This afternoon Turtle Journal visited Chipman’s Cove in Wellfleet Harbor as high tide flooded its salt marsh edges to check to see if any diamondback terrapins remained active or whether they had slipped into winter brumation. The weather was early fall perfect with open sunshine and mid-70 temperatures. If turtles were active in Wellfleet, they would be visible snorkeling in Chipman’s Cove. We saw no sign of turtles, but as we watched, we spotted a prominent dorsal fin about a quarter mile across the cove. 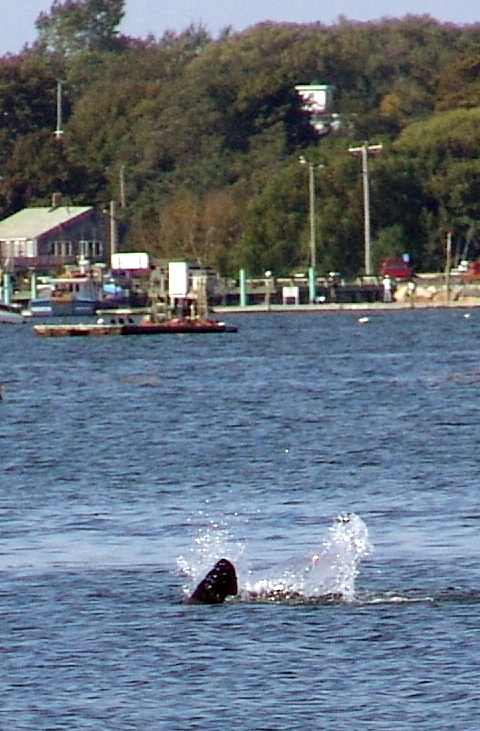 At first sight, we suspected either an ocean sunfish or perhaps a basking shark. But as we continued to watch, we became more convinced it was a Mola mola until finally, the fish surfaced completely to confirm our assessment. 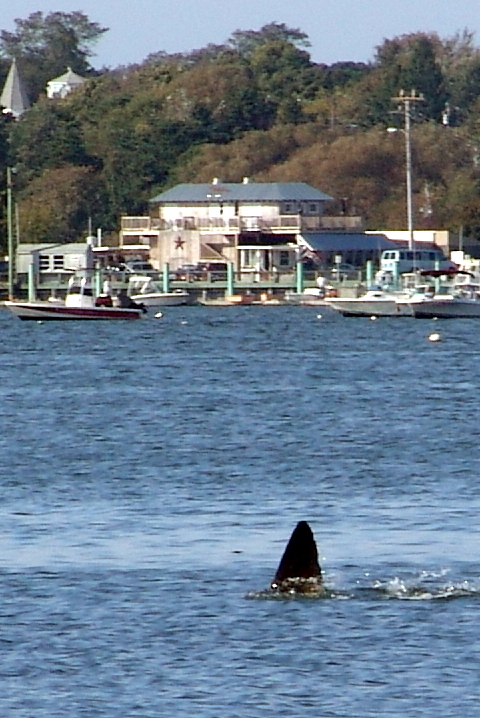 The eratic movements we witnessed, as well as the slapping and flailing of the dorsal fin, were reported by an observer who reported another ocean sunfish in nearby Wellfleet Harbor about two weeks ago. That ocean sunfish was discovered stranded several days later. 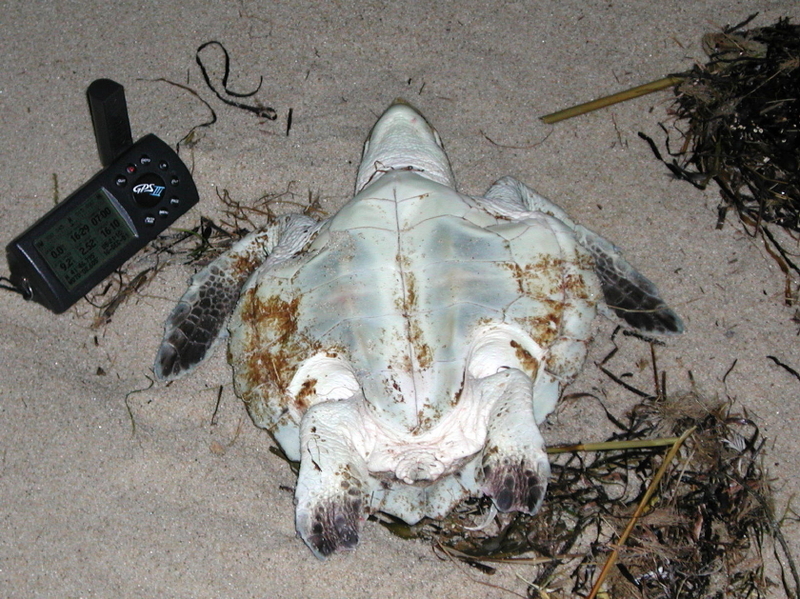 Turtle Journal alerted the NEBShark network and Mass Audubon’s Wellfleet Bay Wildlife Sanctuary. We will all continue to observe the area for the next few days in case the animal reappears. 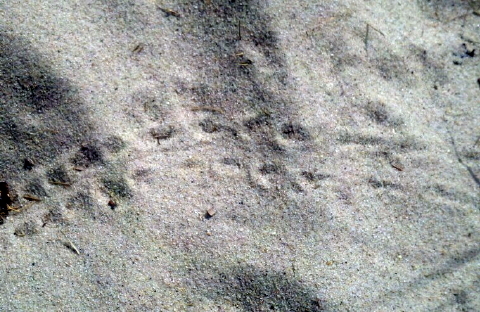 Turtle Journal discovered fresh hatchling tracks heading from the dunes to the marsh at Sandy Neck in Barnstable. 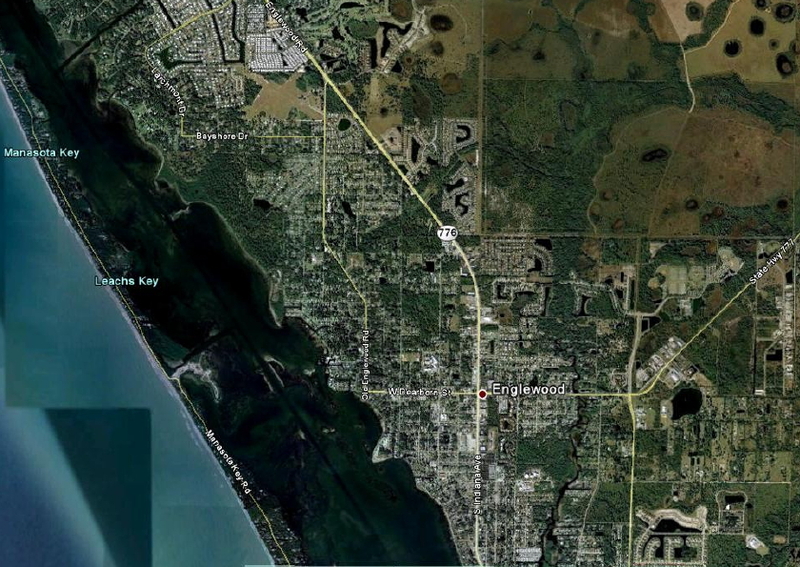 One track appeared at the .4 mile point along the marsh trail; the second at the half mile marker. Nearly 80° on September 25th on Cape Cod! we can learn a lot by studying turtles. Marion resident Don Lewis — also known as “The Turtle Guy” — first became interested in wildlife when he was asked to research endangered marine turtles. He is the executive director of the Massachusetts Association of Conservation Districts, responsible for protecting and conserving all the natural resources within the 14 Massachusetts conservation districts. A: Well, maybe because I’m cold blooded, what do you think? (Laughs.) I started working on marine turtles and spending all of my time, 24/7, researching turtles and doing conservation of turtles … After a decade of doing that, people start thinking of you as the turtle guy. Q: Why did you decide to focus on turtles, in other words, why are you fascinated with turtles? A: Well, when you’re an old retired guy or a young retired guy, you want to find species to research that you have a reasonable chance of catching. The real answer is that turtles are a bellwether species … for all of the habitats that they occupy. If you study turtles and you find out that their populations are in decline, then you know that there’s something wrong with the habitat … Turtles are located on the six habitable continents. You can find them in the habitats from the deep blue sea, to the deserts. By studying them you get to learn about the health of the habitats they live in, and that’s why turtles are so cool. So, if you’re studying the sea turtles, you’re learning about the health of the ocean … When you’re studying the eastern box turtle, for instance, you learn about the health of our neighborhoods. Q: If you had to describe your work with one word, what would it be and why? A: The word is discovery because every day that I’m involved with wildlife is a day that I learn something new. Every day I’m out studying wildlife, not only do I learn something, but I learn something that I can apply to save the environment. Q: What can turtle lovers do to protect their turtles? How should people take care of them? A: Turtles belong in the wild, and the best thing that we can do is to keep turtles in the wild and protect their habitats. That’s why every time I am given a turtle to rescue; my primary goal is to get it back into the wild, where it can preserve the wild populations. Some of (the) things we can do (are) if we see a turtle in distress, we can call the turtle guy, and if we see a turtle crossing the road … we always try to help it across in the direction that it’s heading in. The most important thing we can do for turtles is to preserve their habitat. Q: Do you think that someday turtles may disappear from the planet? A: Turtles have been around for 300 million years. They survived the dinosaurs. They survived the asteroid that killed the dinosaurs. They survived the glaciers. They survived global warming and if I had to put my money on them, I’d say they’re going to survive us. I think the chances are a lot better for turtles than they are for humans, and humans can learn a lot by studying turtles. Lewis has been conducting research projects on endangered wildlife for twelve years. His favorite turtle is the Diamondback Terrapin because it is the bellwether species for our coast. What he loves the most about turtles is their persistence. 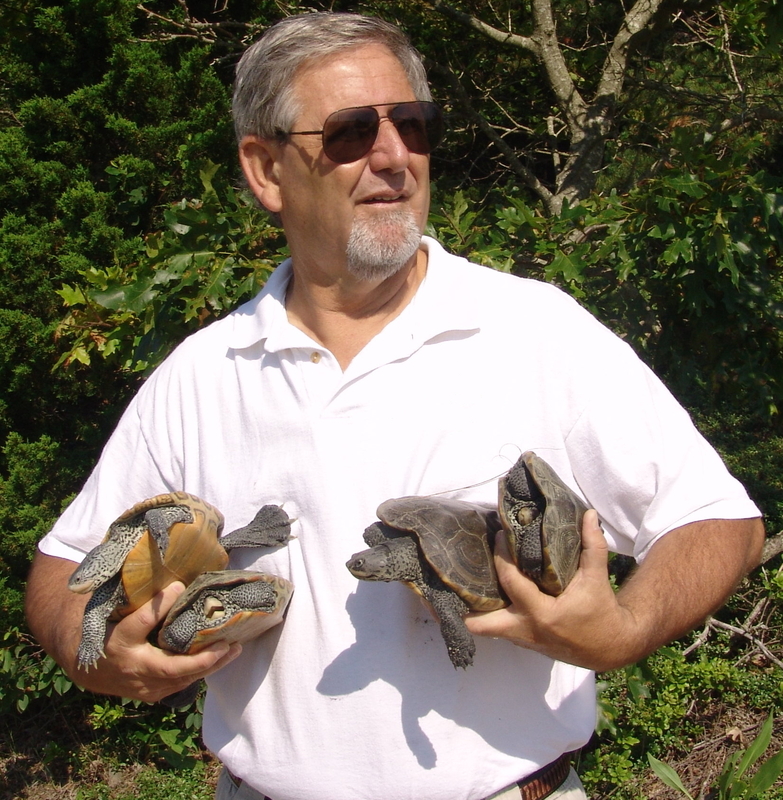 For more information, call Lewis at 508-274-5108, e-mail him at theturtleguy@comcast.net, or visit http://www.turtlejournal.com/. A perfect summer ends and fall brings dramatic change to Cape Cod. Not just foliage, but the whole fabric of coastal life transforms from easy summer to harsh winter. Summer’s gentle breezes, cerulean skies and toasty beaches are blown away by autumn storms that howl across the bay. Summer ripples grow into towering breakers that reshape beaches and deposit oceans of treasure on the shoreline. Buried among seaweed, flotsam and jetsam lie adventure and discovery in the form of marine creatures that are tossed ashore to helplessly succumb to the elements. 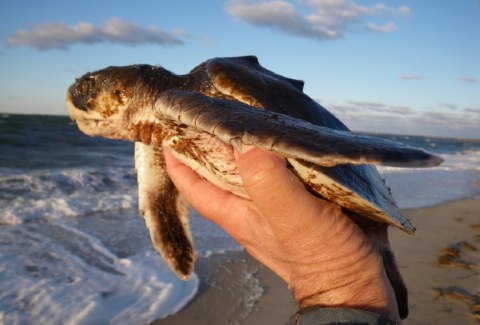 Yet, thanks to beach patrols launched by Mass Audubon’s Wellfleet Bay Wildlife Sanctuary, more than a thousand of the most endangered sea turtles in the world have been rescued from these impossible circumstances and restored back to the wild. Countless marine mammals, giant ocean fish and amazing denizens of the sea have been recovered, yielding breakthrough discoveries chronicled in nature magazines and scientific journals. And now you’re invited to experience this adventure first hand in Mass Audubon’s Marine Animal Stranding Weekend. On the weekend of November 5th to 7th, Mass Audubon invites a few adventurous souls to join its crack team of coastal rescuers. From Friday to Sunday, teams will scour beaches, day and night, from Provincetown to Sagamore in search of distressed animals. 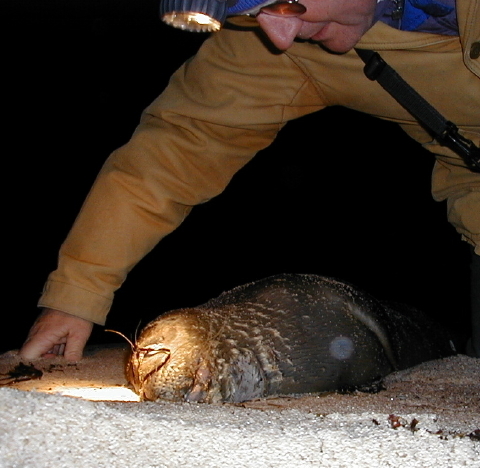 In between high tide patrols, participants will take a bayside cruise to Billingsgate Shoal to gain a sea critter’s eye-view of the coastline, to search for pods of pre-stranding animals, and to investigate harbor and grey seal colonies, as well as overwintering seabirds and sea ducks. Experts will reveal secrets of marine biology and coastal ecology in seminar settings and one-on-one lab work, and still have time to join participants for quiet dinner conversation about the future of the world’s oceans and their most precious species. Still, the most extraordinary adventures come with midnight high tides. In crisp November skies, stars hang like Christmas tree ornaments suspended in a shimmering Milky Way garland stretching from Sagittarius in the south to Cassiopeia’s “Big W” in the north. Footsteps fall silently in the soft, moist sand. The only sound comes from pounding surf that explodes in your path as a 12-foot flood tide recedes to reveal secrets left behind in the seaweed strewn wrack line. The beam of your flashlight arcs from dune to sea and back again, searching for mysterious shapes hunkering in the dark shadows. You never know what the night may reveal. 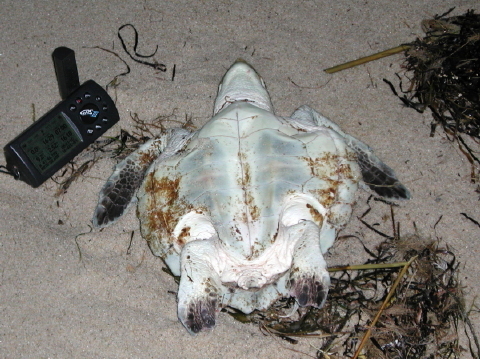 Perhaps a cold-stunned Kemp’s ridley sea turtle tossed upside down on the beach by a northwesterly gale. Recovering this semi-tropical animal from the cold darkness before hypothermia sets in will make the difference between life and death for this turtle and may make the difference between survival and extinction for this critically endangered species. Around another bend might lurk a giant ocean sunfish trapped on the flats by a receding tide. 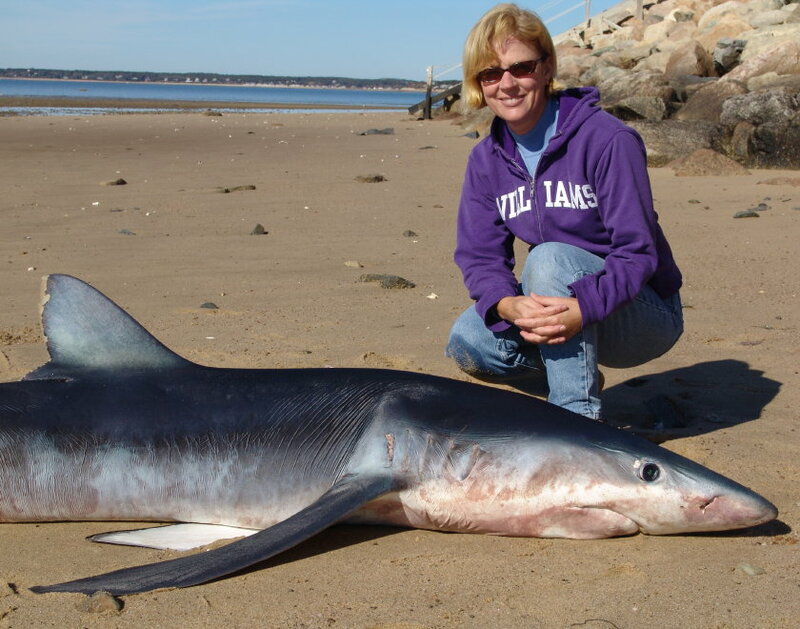 This bizarre looking creature represents the largest bony fish in the ocean and can be found on Cape Cod beaches each fall. For an electrifying experience, don’t discount a large torpedo ray that stuns its prey with 220 volt charge. Ouch! 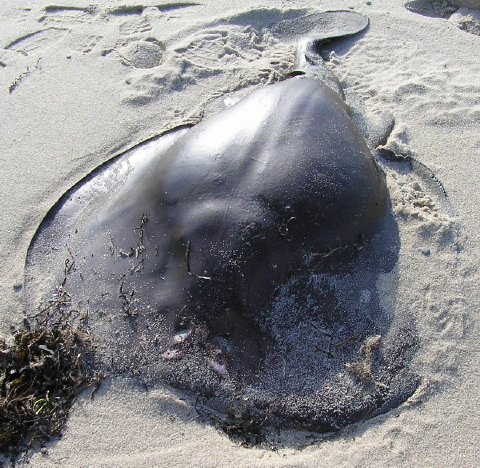 Last year brought nearly a dozen torpedo rays onto bayside beaches from Truro to Sandwich. Nature, especially on the Outer Cape, offers no guarantee of weather or animals. 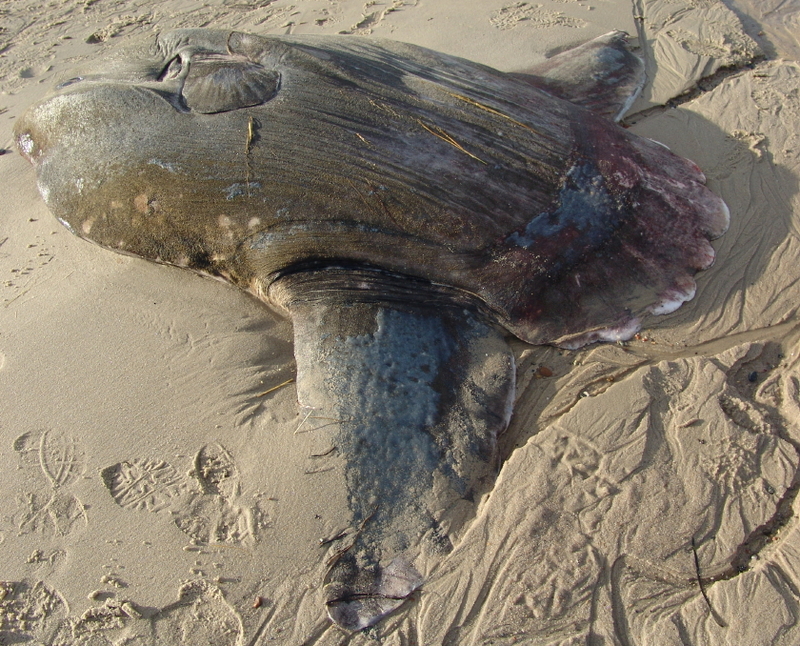 Stranding events are driven by prolonged wind conditions, dropping water temperatures and tidal flows. Yet, early November marks the beginning of the historical stranding period. And, no matter what has been found in the past, what is absolutely guaranteed to greet you around the next bend in the shoreline is the challenge of the unknown and the adventure of a lifetime. Mass Audubon’s Marine Animal Stranding Weekend offers a once-in-a-lifetime experience for the adventurer deep inside you; the one who remembers so fondly those great moments of summers past and who finds the walls of boardroom, classroom, operating room, living room, corner office or office cubicle a bit too claustrophobic to endure the whole, long winter without a refreshing breath of cutting edge discovery. Welcome to a weekend unlike anything you have ever experienced. Welcome to the Marine Animal Stranding Weekend at the Wellfleet Bay Wildlife Sanctuary. For more information about this unique opportunity, contact Melissa Lowe at Mass Audubon’s Wellfleet Bay Wildlife Sanctuary at mlowe@massaudubon.org or 508-349-2615. 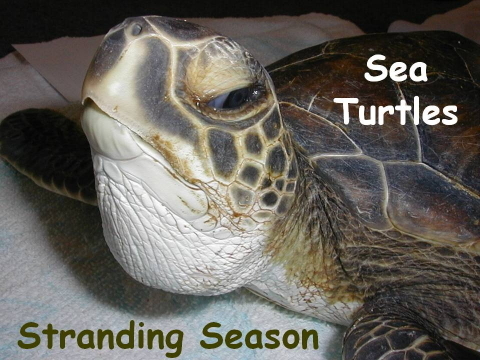 For a virtual preview of the experiences that may greet you, click on Turtle Journal at http://www.turtlejournal.com/?p=3515 for photographs and video clips from last year’s stranding weekend. As long shadows form and days begin to shorten, Turtle Journal’s thoughts and plans turn to sea turtle rescue season. Endangered juvenile sea turtles become trapped in the great seine net called Cape Cod Bay that stretches forty miles into the North Atlantic and “catches” turtles as they migrate south with dropping sea temperature. The warmer the summer season, the higher the probability that increased numbers of sea turtles will get trapped in the bay and become cold-stunned in November. 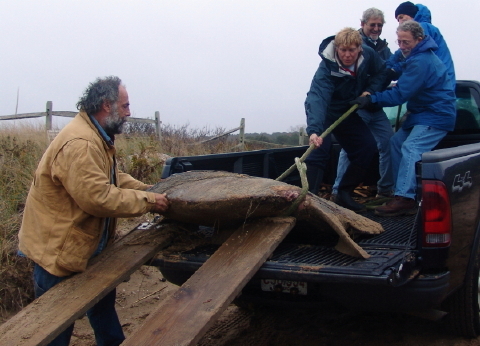 Over the last few decades more than a thousand of the most endangered sea turtles in the world have been recovered off Cape Cod beaches by volunteers organized by Mass Audubon’s Wellfleet Bay Wildlife Sanctuary (see Gearing Up for Sea Turtle Stranding Season on Cape Cod). The overwhelming majority (more than 90% in recent years) have been juvenile (1.5 to 3 year old) Kemp’s ridley sea turtles. 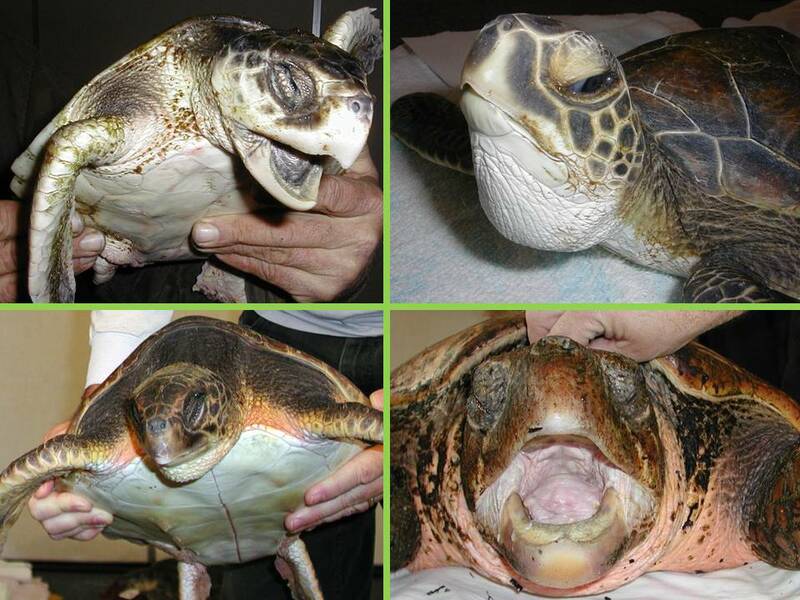 Other rescued sea turtles include loggerheads, greens, hybrids and rarely hawksbills. 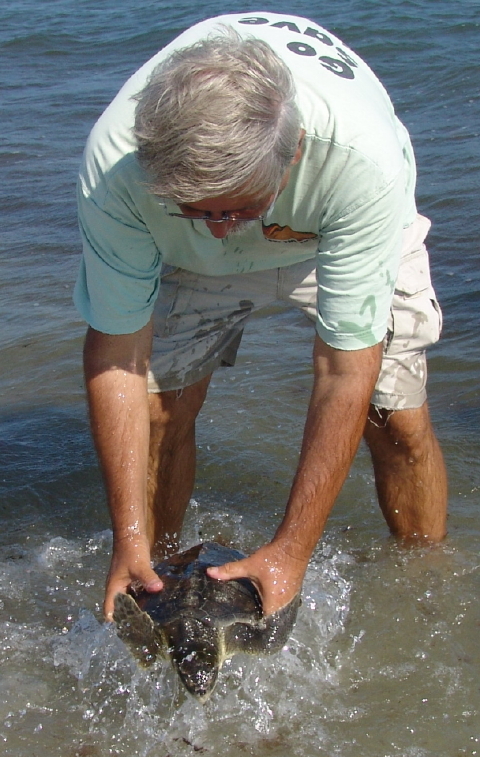 This youngster pictured above was rescued by Turtle Journal early in the 2008 stranding season at Chapin Beach in Dennis (see Saving a Critically Endangered Sea Turtle). Because it preceded the actual cold-stunning event by nearly two months, and was still quite lively, we decided to release it directly into Nantucket Sound so that it could continue its journey southward uninterrupted by a trip to the rehabilitation wards. At Dowses Beach in Osterville we released the young Kemp’s ridley and watched as it quickly swam off into the depths of Nantucket Sound. 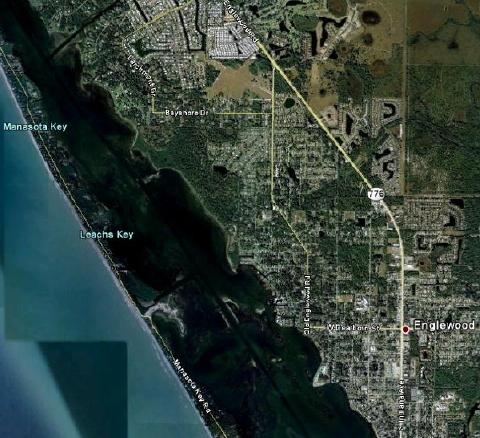 On May 26th, 2010 Jessie Couto of the Coastal Wildlife Club filmed a female Kemp’s ridley sea turtle nesting at Blind Pass Beach on Manasota Key off the Gulf of Mexico. This all volunteer club is licensed by the Florida Fish and Wildlife Conservation Commission to survey beaches in Sarasota, Charlotte and Lee counties, protecting endangered sea turtle nests. 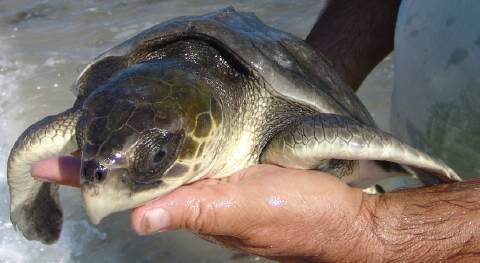 This female Kemp’s ridley, though, proved unique; she laid the first observed nest of this most endangered species of sea turtle on Manasota Key, perhaps colonizing a new nesting site for Kemp’s ridley along the Gulf Coast of Florida. The Coastal Wildlife Club generously shared these video clips with Turtle Journal, so that we can see what the potential impact of our rescue operations here on Cape Cod may have on the full life cycle of Kemp’s ridley turtles. Perhaps from the more than one thousand Kemp’s ridleys that we have recovered cold-stunned and helpless from Cape Cod Bay and returned back into the wild, perhaps one of these rescued females has colonized new Gulf of Mexico beaches like this pioneering female. As we watched the video of this female Kemp’s ridley completing her nest on Blind Pass Beach, we couldn’t help drawing the comparison with the “footwork” of our local diamondback terrapins that seem to have mastered the same rear limb steps in the dance for turtle survival. As the camera records her return to the Gulf of Mexico after successfully completing her nest, we can imagine the full cycle of Kemp’s ridley conservation. Some of our colleagues in Rancho Nuevo, Mexico, Padre Island, Texas, and now Manasota Key, Florida observe nesting and protect eggs through incubation and hatchling release into the sea. We take on the role of patrolling frigid, storm-tossed beaches of Cape Cod each November and December rescuing young juveniles trapped by the cold and near death from hypothermia. Our friends at the New England Aquarium provide emergency medical care to these weakened sea turtles and, with our other partners throughout the Northeast, provide long-term rehabilitation. Finally, we get to return these rescued turtles back into the wild to restore a critically endangered population (see World’s Most Endangered Sea Turtle, Rescued in Winter by Turtle Journal, Released in Summer). Whether any single turtle matches all aspects of this continuous story of rescue and conservation matters less than the big picture story itself: conservationists throughout North America banding together as partners to save the future of sea turtles on this ocean planet. If you’d like to help save endangered sea turtles from certain death during the fiercest weather conditions of November and December in the Great White North of Cape Cod, let us know at Turtle Journal (turtlejournal@gmail.com) by email or through our hotline (508-274-5108) or get in touch with volunteer coordinator Cynthia Franklin (cfranklin@massaudubon.org) at Wellfleet Bay Wildlife Sanctuary at 508-349-2615. For those less agile and adventurous to challenge dangerous storm-tossed beaches in the dead of night, there are many ways to help this rescue program from offering clean towels to driving rescued animals from triage in Wellfleet Bay to treatment at the New England Aquarium. Thank you in advance for saving some of the world’s most endangered, yet charismatic, creatures. You are currently browsing the Turtle Journal blog archives for September, 2010.